North of St Peter’s Basilica and affiliated to it lies the Sistine Chapel. Although strictly speaking it is located in the Vatican City and not in Rome, it is still counted as one of the tourist attractions of Rome – alongside the other tourist attractions in the Vatican. The Sistine Chapel is with every right one of the World Cultural heritage sites. It is known all over the world. This beautiful sacred building was erected and inaugurated in the year 1483 at the behest of Pope Sixtus IV; from whom the Chapel derives its name. The outer dimensions of the building are similar to that of the earlier Temple in Jerusalem. Significantly involved with the architectural design of the chapel was the most famous of all Renaissance artists. It was he who created the ceiling painting which, in general is probably the most famous painting in the world. On a surface of over 500 square metres, scenes from the genesis are depicted. Particularly well known is the scene of ‘the creation of Adam’. According to reports, the artist painted some of the scenes whilst lying on his back on some scaffolding. Other famous paintings in the Sistine Chapel are the altar frescoes depicting the Last Judgement. Incidentally, the Sistine Chapel was never the private chapel of the Popes. Church services are only held here on special occasions. The papal election – the famous conclave also takes place in the Chapel. The Sistine Chapel is a part of the Vatican museums – but only a small part. The Vatican Museums are the largest of their kind in the world with their unique art and cultural treasures. A visit to this unique art collection is one of the highlights of every visit to Rome. 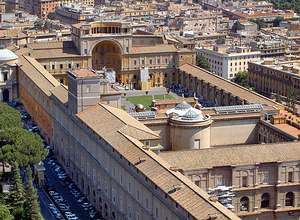 One must factor in enough time for them however, as the Vatican museums consist of 12 building complexes with over 1,300 rooms; a complete tour is 7km long. On display are oriental antiquities mainly from Egypt and Assyria, exhibits from classical antiquity (Greece and Rome), Etruscan antiquities, early Christian and medieval art. Other exhibits are from the Renaissance as well as contemporary works. An Ethnography collection can also be visited. The opening times of the Vatican Museums and the Sistine Chapel change from year to year. In general they are open in the mornings from 9-12:30, in spring and summer to 15:30. They are closed on Sundays and on religious holidays. One can reach the Vatican Museums and the Sistine Chapel via the metro – line ‘A’, station ‘Ottaviano’ or using the bus, routes 23 or 81, bus stop ‘Piazza del Risorgimento’.